I'm interested in simple line drawing and would love to become good at it. My favourite Picassos, along with his Blue and Pink Periods, are his line drawings. They are simply exquisite. 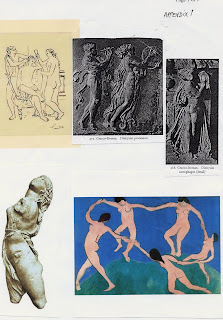 Interestingly, they are obviously highly influenced by the style of the ancient classical Greek Maenads and Dionysiacs. Also, look at Matisse's 'Dance' - straight out of the Greek classical style. That is really intetesting, to capture so much in simple lines really is fantastic. I think you're on the right path anyway, I really like your Rhino and Elephants! The owl is fabulous too of course but totally different :) Lovely soft feathery effect, well done! You are absolutely right about Matisse, I never saw it before but it makes complete sense now that you've mentioned the connection with greek art, their ceramics, etc. And still really like your owl.Has an archetypal feel to it if thats the right word.